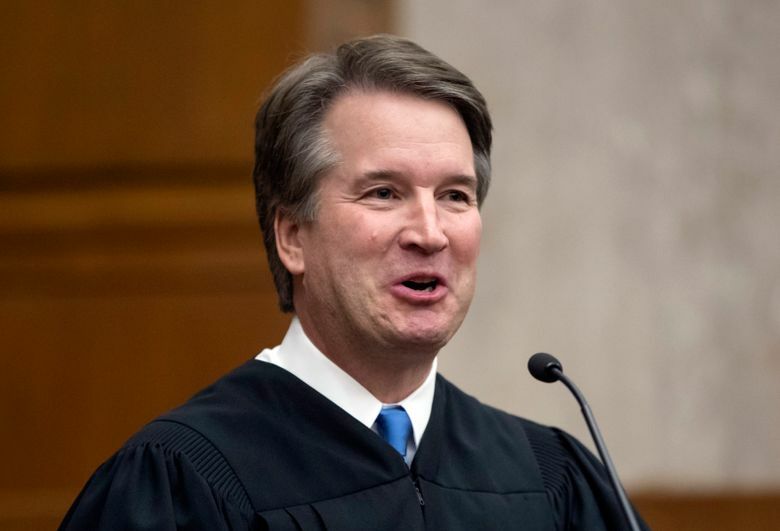 WASHINGTON (AP) — Does Brett Kavanaugh belong on the Supreme Court? It’s a question that may be consuming Washington, but one that elicits a shrug from many Americans. And there’s also no nationwide consensus on whether the Senate should vote on his nomination before Election Day. That’s according to a new poll from The Associated Press-NORC Center for Public Affairs Research, released Wednesday, that finds nearly half of Americans — 46 percent — don’t have a strong opinion on President Donald Trump’s nominee to replace the retiring Justice Anthony Kennedy on the high court. That ambivalence runs even deeper among independent voters, as fully two-thirds say they’ve not formed an opinion on whether the federal appeals court judge deserves a promotion. Some people who haven’t yet formed an opinion say they need more information. “I do want to learn a little bit more before I make up my mind on the guy,” he said. Tomlinson and the rest of the county will get that chance next week, when the Senate Judiciary Committee begins confirmation hearings on Kavanaugh’s nomination. Republicans hope to have Trump’s nominee confirmed by the start of the court’s new session on Oct. 1. Conservative groups are spending millions on television ads designed to pressure Democratic senators to buck their party and support Kavanaugh’s confirmation. The ads mostly target voters in Indiana, West Virginia, Alabama and North Dakota, all states Trump handily won in 2016. Meanwhile, liberal groups are running anti-Kavanaugh ads in Maine and Alaska in the hope that Sens. Susan Collins and Lisa Murkowski, who support abortion rights, will decide to vote no. Among all Americans, those who do have an opinion divide about evenly, with 25 percent in favor of Kavanaugh’s elevation to Supreme Court justice and 29 percent opposed. Those opinions are divided primarily by partisan lines. “From what I’ve studied, he’d be a great candidate, No. 1, and the other reason is, I don’t trust the Democrats,” said Martin Stefen, 73, of Carson City, Nevada. He’s among the 78 percent of Republicans who believe a Senate vote should happen before the election. More than half — 56 percent — say they favor Kavanaugh’s confirmation, with just 4 percent opposed. Kavanaugh spent about five years working in the White House under President George W. Bush as a legal counsel and then as staff secretary. He has served for 12 years on the U.S. Court of Appeals for the District of Columbia Circuit, authoring some 300 legal opinions. Stefen said he views Kavanaugh as someone who “wouldn’t go along with politics” from the bench. “He’d be ruling fair and square, no matter what,” Stefen said. “If we do it before the midterms, it’ll go too quickly and we’ll have too many conservatives on the court, and I don’t think that’s a good thing,” said Anna Horton, 50, of Fountain, Colorado, who prefers that lawmakers wait. Horton said she is concerned about what Kavanaugh’s confirmation would mean for issues such as gun control and the environment. But her chief concern boils down to seeing red flags about any nominee who would be selected by Trump. “I just have a lot of mistrust for this administration,” she said.